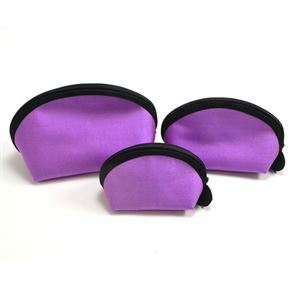 These cute taffeta cases come in a set of three and stack inside each other like Russian dolls They’re perfect for keeping all those essential items close to hand. The zip closure opens fully so you don’t even lose things in the corners. The large one is 9.5cm (3.75")h x 15.25cm (6")w, medium 7.5cm (3")h x 12.5cm (5")w and small 6.3cm (2.5")h and 10cm (4")w.